what do i say about Will Grayson, Will Grayson that hasn't already been said before? on one hand, i am well aware that this novel has its fair share of flaws. i'll be the first to admit that john green writes very formulaic characters, from his dorky male single-child protagonist to the manic pixie dream girl he falls in love with. 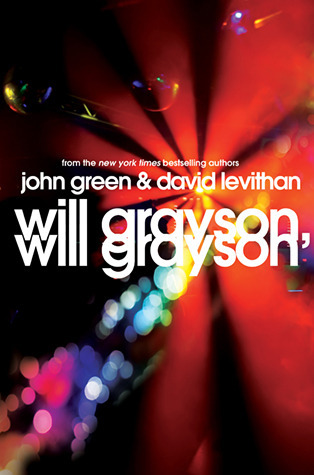 i'll also admit that the characters in Will Grayson, Will Grayson are often annoying, flawed, and highly irritating. its narrative style may grate on some readers, it is kind of hard to connect with at times, and the beginning is disastrously slow. yes, Will Grayson, Will Grayson has its flaws, i'll be the first to admit that, but it also has its own rare form of beauty, brilliance, and heart that in my eyes, more than makes up for any flaws that it might have. Oh man. You're too persuasive for everyone's good, Keertana! I only read twenty-something pages of this when I had the ARC, because, for some reason, despite how much I admire these two authors separately (though neither are perfect), I just didn't find myself being interested in the two characters' lives. But, for some reason, I've held onto my copy of this book. It must be my subconscious telling me I need to give this another try! I was wondering why you weren't using capitals. ;) I can imagine how hard it must be not to press the shift key. It's pretty much an automatic response! I'm glad you enjoyed this book, Keertana. I haven't read anything by either of these authors before (I fail as a reader!) but I do plan to start my first John Green book this year. I like the sound of the storytelling here, with each author getting their own Will Grayson. I'm looking forward to experiencing it myself. :) Fantastic review! Lovely review Keertana! I'm so glad you enjoyed Will Grayson Will Grayson! It was such a fun read. My only complaint was that the ending was anti-climactic. But that was it! Another great review Keertana! I didn't like this one as much as you did - the flaws were a bit more noticeable for me than the good parts, but I'm glad that you enjoyed it and that you're capable of writing such a well-written review of it. I also loved TFiOS but not Looking for Alaska so it's cool that we have somewhat similar tastes. Once again, wonderful analysis and I'm sure many will be persuaded to pick this up if they haven't already! TINY COOPER!! He is such a show stealer in this book. You nailed it when you said he really is the star of the show. I liked this book and the story of the two Will's, but larger than life Tiny is what I will always remember about it:) Great review! I am impressed with how you wrote this review to match the book! I keep hearing about this one, and how I need to read it, but I have yet to invest my time. I'm always interested when two well known, distinctive authors write together and make it work. Though I've noticed David Leviatham doing a lot of co-writing recently. Did you not like Every Day? Or not read it at all? I keep hearing good things about it, so I'm very interested in your opinion. Everyone raves about Tiny Cooper, clearly I need to meet him soon. I was so distracted by your not using proper capitalization! Haha. This one didn't work for me until... Tiny Dancer. I loved Tiny so hard. This is the only John Green I've read and it didn't really compel me to seek out more, although I did buy Fault In Our Stars. God, I'm such a sheep! To be perfectly honest, I'm not overly fond of David Levithan's books or his writing style. That's mostly whyI've been avoiding this. On the other hand, i do love and admire John Green and this is the only one of his books I have yet to read. It does sound interesting and the characters seem to be layered, so that's definitely a plus. I'm sorry I've been MIA lately. I burned my hand pretty badly and typing has been a challenge. Keertana, it's not even fair how you're so creative and persuasive! I can't even imagine how difficult it is to not use the Shift key, I mean, it's second nature to me now. But even with the numerous flaws this book seems to have, you've nonetheless convinced me I absolutely must pick this book up. The writing seems so gorgeous, and it's amazing that the authors could distinguish their two characters so flawlessly. Not only that, but the friendships and self-discovery sound ah-mazing as well. *sigh* I have missed DEARLY reading your beautiful reviews, Keertana! I haven't read WILL GRAYSON, WILL GRAYSON, but from your thoughts in your review, it looks like I REALLY need to. I love your creativity in writing this review, by the way. :) I think Levithan and Green are talented in the way that they're able to make somewhat cliche characters, but make it original at the same time, and I'm so glad you were able to overlook the common storyline/plot. I can't wait to meet the side characters Tiny Cooper and Maura, because they seem like quite big side characters. Lovely, lovely review, Keertana! I definitely wondered about the choice of review style at the start, but know it makes sense. I can imagine how difficult it was to write like that and I'm not sure if I would have been able to resist. Particularly when I like the look of capitals so much. I mean there is something so offensive looking to me about a little "i". However, I am definitely intrigued as to how the authors pull of the writing style and its workings. It definitely sounds like a book that has a lot to offer, from two authors that I've heard lots about. I'm so glad you managed to enjoy this one, Keertana even if you can't pinpoint exactly why. Looking for Alaska is my least favorite John Green book but I love him! I do agree that his characters a formulaic though. But I guess I dont mind. I love them. And the same with David Levithan. I will read everything they both write. So them together was magic. But I'm with you, this book isn't perfect, I had a few issues myself, but I still absolutely loved it. Fantastic review! I have to admit, I've really been turned off of this book. I personally dislike 90% of the author collaborations I read, and I've strongly disliked those by Levithan before...I just don't think he's the author for me. On top of which, I do love John Green, but yes, his characters are pretty stock and that keeps me from jumping at all of his novels. I think you've made so many excellent points about digging under the surface of these characters and seeing the bigger story/message of the book, but I'm still not sure that I'll ever pick this one up. I feel like I should give this another go, it was my first JG book and either my 1st of 3rd DL book, but I just thought it was ok, even after reading lots of +ve reviews. I am a fan of multiple authors writing books together, I think it's fun! I keep putting off reading John Greene, and I don't know why. Partly because I keep seeing a variety of reviews, ranging from raves to "formulaic," per your review, and other such criticisms. I think I secretly fear the books will annoy me and I don't want to dislike them, hah. But wow, this one won you over! I've heard this is one of his better ones. It might be a better one for me to try than TFIOS. Nicely reviewed!